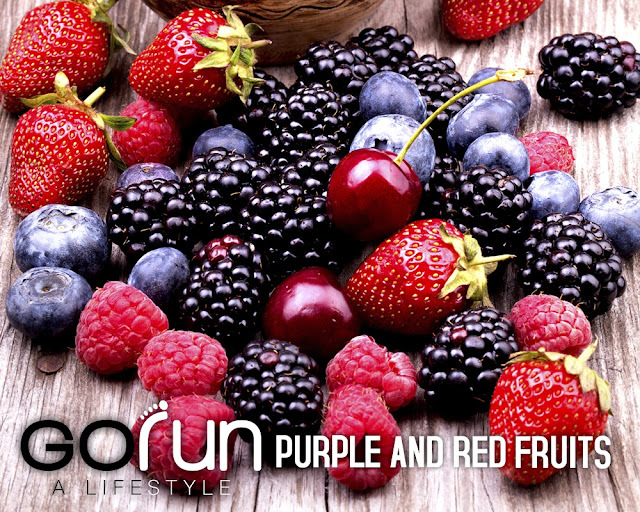 Go Run Miami: RED OR PURPLE FRUIT - Which benefits do they provide? RED OR PURPLE FRUIT - Which benefits do they provide? The practice of exercises, mainly of intense workouts, generates a large increase of free radicals in the body which, in excess, generate the so-called oxidative stress, where there is an imbalance in the production of free radicals and the action of antioxidants. This can cause damage to cellular DNA, increasing the risk of cancer, and harm the recovery after workouts. Red and purple fruits such as blackberry, raspberry, strawberry, goji berry, blueberry and açai berry are rich in anthocyanins, antioxidants that help neutralize the action of these compounds in the body. Moreover, the red fruits also contribute to improved blood circulation.